If your pharmacy exports drugs and biologics to foreign countries, you may be required to obtain an exporters license or certificate issued by the Food and Drug Administration (FDA), the Department of Commerce Bureau of Industry and Security (BIS), and/or the Drug Enforcement Agency (DEA). 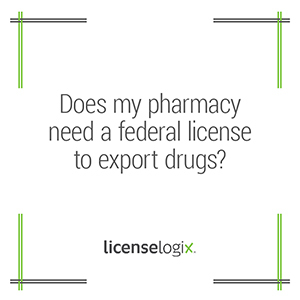 Pursuant to FDA regulation, pharmacies are not required to obtain export certificates. However, many foreign governments do require verification of FDA approval from pharmaceutical exporters as an assurance that products being brought and sold in their countries are suitable to be marketed within the U.S. Thus, it is important that pharmaceutical exporters consult with the importing country to determine exactly what type of information is required. If the host country does require such verification, the FDA is legally mandated, upon official request, to issue an export certificate containing vital information about a product’s regulatory or marketing status within the United States. To apply, pharmacy administrators must consult and complete form FDA 3613b. Exporters must keep in mind that each drug requires a separate application. However, if one drug is being exported to multiple countries, only one application must be used, with separate certificates to be issued for each distinct importing country. Fees include $175 per each certificate, with a reduced fee for each subsequent certificate for the same country in the same application. Certificates will expire 24 months from the date of notification, and thereupon require submission of a new application upon expiration. According to the Department of Commerce Bureau of Industry and Security (BIS), only those pharmaceutical products classified with an ECCN require an export license. These products include but are not limited to: vaccines, immune-toxins, medical products, diagnostic and food testing kits as specifically listed in the Commerce Control List. To apply, pharmacies should consult form BIS-748P which may also be used to request classification of items/materials to be exported, or to request an advisory opinion as to whether a license is required for a particular item/ material for a given end-user and/ or destination. An export license issued by the BIS is valid for four years from the date issued. Furthermore, under the DEA, a yearly exporter registration is required for all controlled substances. Pharmacies intending to export controlled substances must consult DEA Form 225 which, upon submission, involves a 4-6 week processing time and requires annual renewal and fees that range in excess of $1500. LicenseLogix will research complex license requirements, file and manage all pharmacy licenses. To get a free quote today, fill out the box to the right or call at 1-800-292-0909 for more information and assistance.